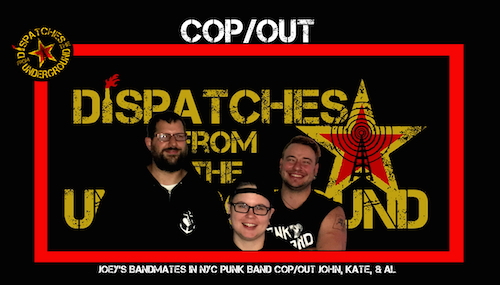 Cop/Out is a new punk band from NYC made up punx from a bunch of other incredible NYC bands. All of the Cop/Out members, John, Kate, and Al along with DftU host Joey Steel get down this week to talk about the band, their sound, and what brings them to do this new band, despite that they are all in other bands. Then on the second half of the show we talk about Punk Island which everyone in Cop/Out organizes. We discuss why Punk Island is so incredible and why other fests obsessed with big, old names and making hordes of money just can’t bring the punk that Punk Island can. PLUS we listen to Cop/Out, The Jukebox Romantics, Baby Got Back Talk, and Nevva.